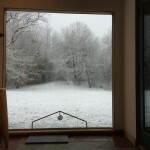 It is snowing here in today but we are not supposed to get much. But it is supposed to be very windy later today – up to 58 mph gusts. My Dad was scheduled to look at some potential archaeology sites out by Worcester today – but he conferred with the rest of the group yesterday and wisely called it off. There are a lot of damaged trees in the woods this year from the one storm that had really heavy snow (see pictures of storm damage in this earlier post) – there are a number of “Widow Makers” hanging around here and being out in 50+ mph winds could be quite dangerous – and uncomfortable too! Anecdotally, my Dad has noted that one of the leading cause of death in Colonial times was being killed by falling tree limbs/widow makers. We have a theory that these are more common when trees grow without a lot of competition (lower stress, faster growth, less strength). Today, New England is a reforestation success story – I believe up until the 1990s the net generation of forest land was enormous, only recently leveling out as farming went into a steep decline here. Around our part of the state, a LOT of trees, of many different species, have been sort of falling apart for no particular good reason that we can see. The only link is that they appear to be the same general age – between 50 and 100 years old. This would have also been common in early colonial times as the pre-contact local Indian tribes used to keep the land fairly clear for farming – but they were heavily decimated by disease early on and that activity would have slowed way down in the late 1500 and 1600’s (possibly). So similar conditions leading to similar weaker than normal trees, leading to more trees falling apart? Potentially difficult to come up with direct evidence to support that theory – but interesting musing. On a different subject, I was out sick for a number of days last week (feeling a bunch better now thank you!) – too much getting woken up in the middle of the night (Brussels bombing alert from work, Fire alarms) on top of a fast trip back and forth to San Francisco. 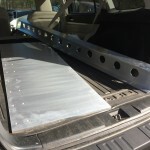 However, Atlantic Industrial Models finished up the I-Beam and it has been delivered to the house. 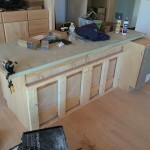 They are still working on sanding the floor but Paul can at least do final measurements for the island. 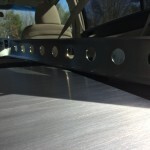 Oh – and Wolfers lighting called and the special order fixtures have arrived. 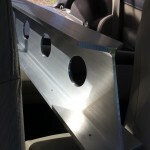 Close up of the machine work – nicely done!